A few weeks back, my mom and I were in search of dinner along the Fillmore corridor and restaurant after restaurant — Delfina, SPQR, DOSA, State Bird Provisions — we struck out, with wait times several hours long. Our late start, lack of reservation (or calling ahead) did us no favors, nor did the flood of extra folks in town for Outside Lands. Happily, Mom spotted Fat Angel tucked away down O’Farrell with only a fifteen minute wait — and judging by the line of folks that appeared behind us and the packed restaurant, our timing was perfect and we were in for a great meal. Their menu, while limited in gluten-free options, is to die for — cheese and charcuterie feature heavily (drool! ), as do flatbreads and hearty salads — comfort food done very well in a warm, inviting environment with a friendly staff. It’s definitely designed to complement their extensive beer and wine menu — if you enjoy Belgian beer, in particular, this place is for you! Clearly I skipped the suds and bread-centric options, instead zeroing in on their baby kale salad topped with bacon, Marcona almonds, Parmesan and roasted chicken. I can’t think of a time when I’ve had kale paired with anything other than sausage, certainly never in a salad, so I didn’t really know what to expect. When it arrived at the table, I was struck by its size, HUGE! — in fairness, I was warned by our awesome server, Derek, that it was a generous portion — easily enough for me to make a meal out of PLUS a side salad for my dining companion. The taste? Phenomenal. The baby greens were nicely dressed with a tangy vinaigrette, and were super tender, surely no massage was necessary, unlike their full-grown counterparts. The almonds and bacon added a nice amount of texture (I certainly didn’t miss the breadcrumbs) and substance, along with the very flavorful roast chicken. I’m all about salads that are more toppings-heavy, especially if I’m making a meal out of one, so this dish was a winner all around. Switching gears, I know I’m always in search of new and exciting ways to jazz up leftover roasted chicken, so this is a great recipe to make if you have some to use up! Hope you enjoy this hearty salad as much as I do! 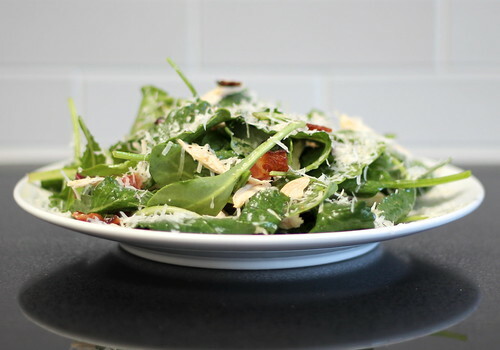 Prepare and set aside ingredients for salad (cooked bacon through greens). In a small measuring cup with spout, combine reserved bacon grease and olive oil (you’ll have 3 tablespoons of grease/oil total); set aside. In a small mixing bowl (2-quart), whisk together Dijon mustard, cider vinegar and lemon juice. Whisking vigorously, very slowly pour in grease/oil mixture until dressing is emulsified. Season to taste with Kosher salt and black pepper. Place greens a large mixing bowl (4-quart+), drizzle dressing over top and toss to coat each leaf well (I do use all of the dressing — it may look like an excessive amount, but the greens can handle it). Add torn bacon, almond halves and shredded chicken, toss to coat with dressing/distribute throughout. Divide salad between serving bowls and sprinkle Parmesan over top. Serve immediately! I Googled baby kale, bacon and almond salad looking for a recipe similar to the one I had at the same resturant. Yum, it was so good! I’m going to try your dressing and see how it goes. Thanks!